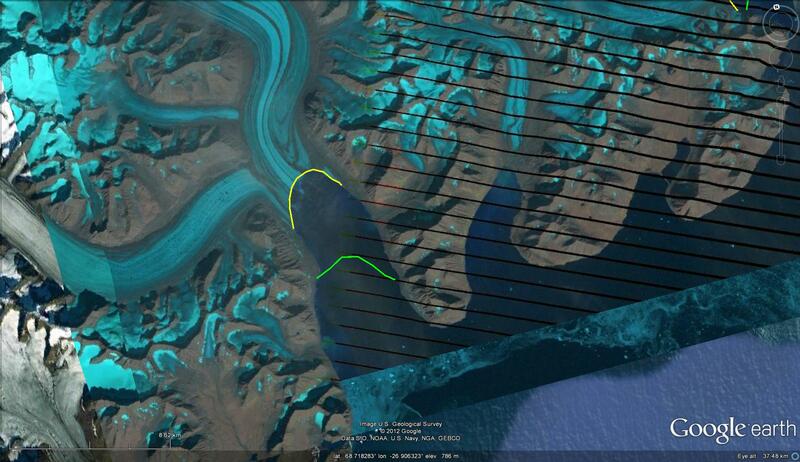 The Sortebrae is a surge type tidewater calving glacier on the Geikie Peninsula of East Greenland. Surge type glaciers do not have a steady ice flow, they have non-steady ice flow where longer quiescent periods of slower flow are punctuated by short periods of faster flow. 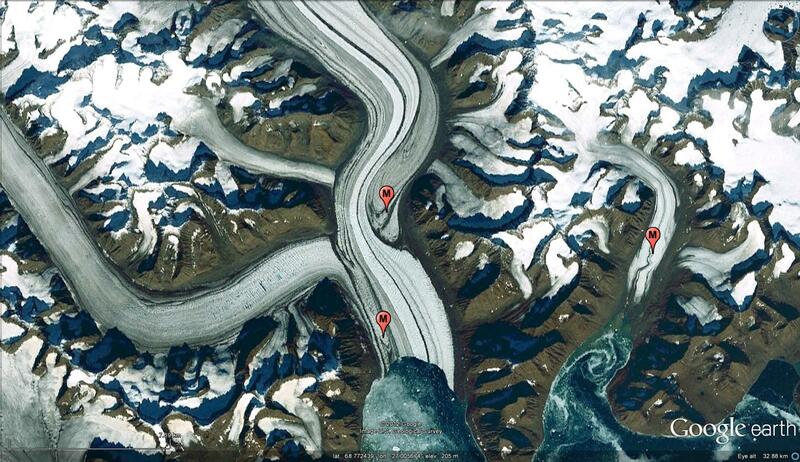 The glacier is comprised of a number of tributaries (A-D) some of which drain the main Greenland Ice Sheet (E). Sortebrae surged in the 1950’s and 1992-95 (Jiskoot et al, 2001). 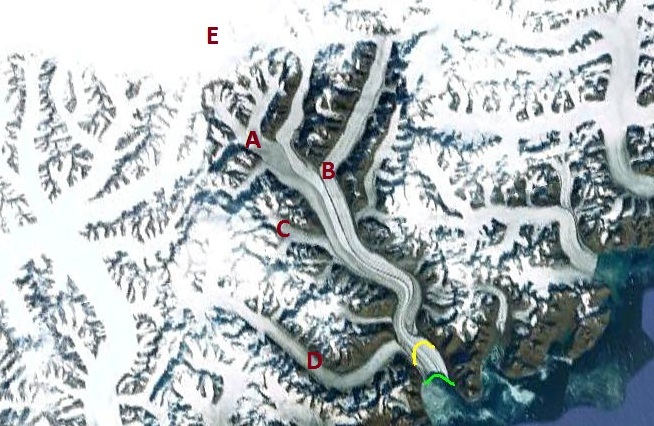 A diagnostic feature of surging glaciers is the looped or distorted medial moraines (M) that results from the changing degree of contribution of the various tributaries of a surging glacier with time. Not all tributaries surge and if they do it is not necessarily synchronous . The 1992-1995 period featured a 5 km advance, this suggests a periodicity to surging of 4–70 years (Jiskoot et al, 2001). From 2000-2005 the retreat rate was noted as 428 m/year by Jiskoot et al (2012). Comparsion of Landsat images from 2000 (green line) and 2010 (yellow line) indicate a retreat of 5 kilometers, approximately 500 meters/year. Surging glaciers are still sensitive to climate, the surge cycle is an additional factor affecting surface elevation and terminus change. In this region the recent extensive retreat of Sortebrae mirrors that of the other glaciers, Jiskoot et al (2012) identify that just one of 113 tidewater glaciers in the region advanced, and that was during a surge. Average margin retreat rate in terms of area lost increased from 2 square kilometers per year between 1980 and 2000, to 4-5 square kilometers per year from 2001 to 2005.. Given the fact that the glacier is not due for a surge in the next couple decades, a continuation of this retreat for even one decade will lead to the separation of the terminus. With the termini entering from the southwest (red arrow) and the main termini (green arrow). The southwestern tributary does not exhibit strong surging features. 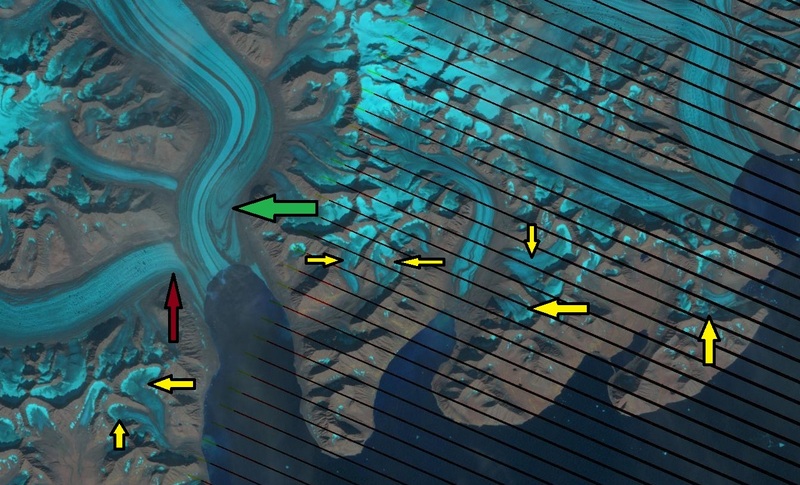 It is also worth noting quite a few smaller glaciers near the coast here have very limited snowcover remaining (yellow arrow) near the end of the 2010 melt season. 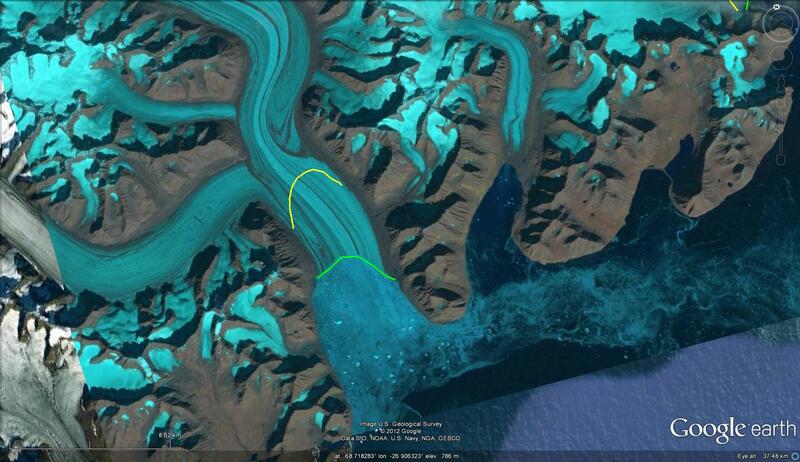 This is not a good sign as glacier that do not have consistent accumulation zone will not survive (Pelto, 2010). Given that 2011 also featured limited snowpack it seems to be a too frequent theme for the smaller glaciers in the region. The mass loss of smaller glacier in this region has has been particularly well observed on Mittivakkat Glacier by Mernild et al (2011).